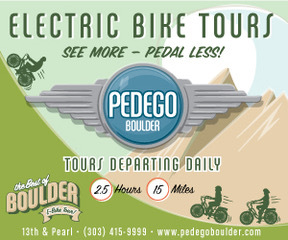 So you want to stay in downtown Boulder, in the heart of the action within a few steps of the Pearl Street Mall. 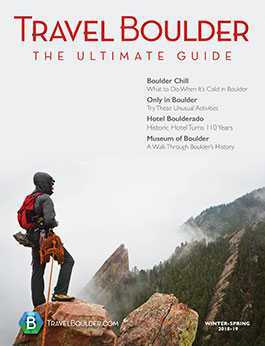 There are a handful of lodging options to choose from — and while these are some of Boulder’s finest places to stay, they’re all a little different. Their individuality makes it difficult to directly compare them side by side. So in this case, the best place for you to pick depends on what your priorities are. 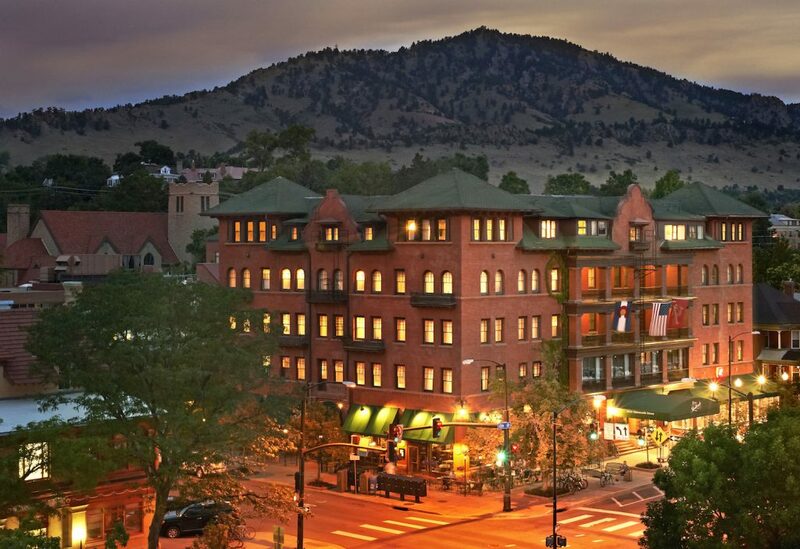 Here’s a look at three of the main downtown Boulder places to stay — the Bradley Boulder Inn, St Julien Hotel and Spa and Hotel Boulderado — and what makes them stand out. Location: 900 Walnut St., just one block from the Pearl Street Mall on the west side of Pearl. Average price for a standard double room: The lowest rate in peak season (May through October) is $395 for single or double occupancy. About the rooms: Rooms are spacious, modern and luxurious, with custom-made beds, European pillow tops and duvets and may have mountain views. The bathrooms are incredible: large and slate with soaking tubs and walk-in showers. The St Julien has 201 rooms. Atmosphere: Sophisticated and upscale, with oversized windows presenting mountain views, a cozy lobby fireplace, regular live music, beautiful patio space and a hoppin’ lobby. A few years ago, the St Julien revamped the property, including new furniture in the lobby and more, so it feels brand new. What makes it different? The St Julien is an institution in and of itself. Plus, it’s the only downtown hotel with an on-site hotel spa. And the 10,000-square-foot, full-service Spa at St Julien is one of the best in Boulder. Get your nails, hair and skin treated; some treatments are even made out of herbs and flowers from the hotel’s own herb garden. Highlights: The St Julien was named the No. 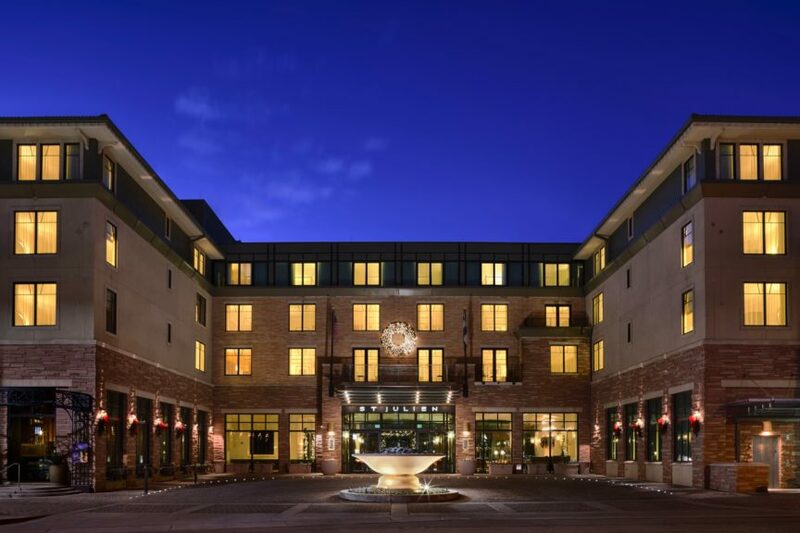 1 hotel in Boulder in 2018 by the US News & World Report. It’s also a member of Preferred Hotels and Resorts, a AAA Four-Diamond Property and a Forbes Travel Guide Four-Star Hotel. That’s quite an impressive resume. Food offerings: No food included but there are solid options under the same roof, including the reputable Jill’s Restaurant and the T-Zero Cocktail Bar. Amenities: DirecTV (even HBO and the NFL Ticket), Italian linens, a robe, slippers, spa access, lap pool, hot tub with mountain views and a fitness center. 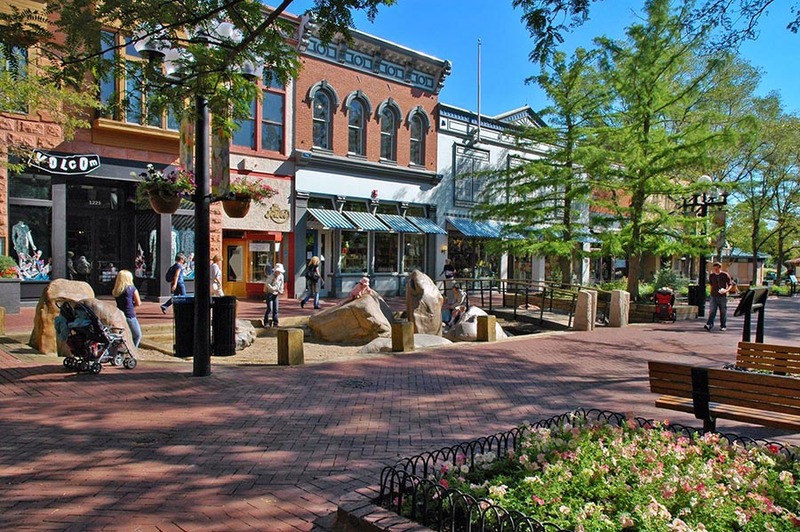 Location: 2115 13th St., barely two blocks north of the Pearl Street Mall, but right in the center of the mall, not far from Broadway and close to the Boulder Theater. Average price for a standard double room: Average price in the high season (barring home football games or other CU special events) is about $379. The Boulderado has 160 rooms. About the rooms: There are two types of rooms: the historic rooms, appointed with Victorian furniture and decor, and newer rooms with contemporary furniture and nature-inspired decor. Both have modern amenities, evening turn-down and newspapers. Also ask about the carriage house guest rooms, if you want more space and privacy. Atmosphere: The tall, brick Boulderado is totally unique. It’s a glamorous, historic landmark. The lobby is dramatic, with Victorian decor and an impressive stained-glass ceiling and windows above dark wood, winding staircases. Take the old elevator for a fun experience (albeit a tight squeeze). The hotel is on the National Register of Historic Places. What makes it different? This hotel is Boulder. In fact, it’s Boulder’s oldest hotel, dating back to the early 1900s. It’s always been upscale and reputable. Highlights: The lobby is an impressive site. Even if you don’t stay here, it’s worth a visit to gawk at. Walk through the hallways and you can see antique furniture and small historic exhibits. Touring through the hotel is like a mini, unofficial museum of Boulder’s history, which is something you can’t get in any other downtown hotel. Food offerings: A pretty fantastic restaurant, Spruce Farm and Fish (with great meals from breakfast to dinner); a sultry, speakeasy-style bar in the basement, License No. 1 (one of the first bars in Boulder to get its license to legally serve alcohol after the Prohibition); and a Boxcar Coffee cafe, serving locally roasted java. Amenities: An on-site fitness center as well as access to a nearby gym, access to a limo or town car service, electric car charging stations, free wifi, cable, terrycloth bathrobes and excellent service, to name a few. Location: 2040 16th St., on the east end of the Pearl Street Mall and a half block from the Pearl Street Mall. The Bradley is the closest downtown hotel to the mall. However, it is on the east end, about a block past the walking mall. While the pedestrian stretch of Pearl is quintessential Pearl Street, there are still a ton of great restaurants and shops on the east end, such as Mountain Sun Pub and Brewery, right across the street from the Bradley. Average price for a standard double room: All-inclusive rates run from $200-$300, depending on the season. About the rooms: Every room is different and spacious, with features such as mountain views, jacuzzi tubs, balconies and fireplaces. Atmosphere: The Bradley is a small inn (with 12 rooms), much smaller than the other downtown hotels, so there’s a personalized feeling. While the Boulderado is historic and the St Julien is modern, the Bradley is the middle ground. It’s 25 years old but built to fit into the historic neighborhood; it’s a 14,000-square-foot hotel in the middle of the Whittier neighborhood. “The draw is it feels old world, yet it’s not. It’s more craftsman, built with a very big, oak staircase, banisters, oak finish throughout. It’s that classic Craftsman inside but with a Victorian look outside,” says Collaton with the Bradley. What makes it different: Instead of standing in line to check in, you’re whisked into the great room with a glass of wine to sit by the huge, river-rock fireplace. “Small is better to me,” Collaton says. Highlights: Everything here is included, from on-site parking to wifi, no matter how many eggs, bottles of water or glasses of wine you enjoy. Food offerings: A wine and cheese hour every night with appetizers, coffee and tea and breakfast in the morning, all included. No restaurant on site for other meals. Breakfast included: Yes. There’s homemade granola, options for different dietary restrictions (gluten-free, vegan, vegetarian), quiche, blueberry French toast casserole, to-order pancakes with blueberries and real maple syrup and fresh eggs made to order. Guests also get access to a nearby health club, but there is not one on site.